It’s official. Winter coats have emerged. Mornings are frost bitten. Autumn is here. While I’ve not yet decided whether or not I’m quite ready for it, (not that autumn cares), it has given me another idea for using up this rather large quantity of carrots I’ve somehow landed myself with. (And turmeric, well, because I've been consuming it in abundance to ward off the masses of cold-infected humans that suddenly surround me). Now, I’m about to admit something that I’m fairly certain no food blogger should ever admit (even though maybe secretly we all already know...). I did not measure any of the spices in this recipe when I made it… Please don’t abandon ship. But the point I’m trying to make is simply that you don’t need to. Baking is about measurements. Cooking is about intuition. (Thus your kitchen life should include equal amounts of both - for a balanced lifestyle - but that’s a separate issue). These recipes are guidelines. Guidelines for flavour combinations and techniques. Everyone’s palates are different and pantries vary. This is what mine provided. So in Food 52’s No Recipe Needed style, here’s a recipe with dare I say it, ‘guestimated’ spice quantities. Add to them. Take away from them. But do it to your taste, and do it with confidence. All that said, if you’re unsure, use these the first time through. This spiced carrot soup will warm you in all the right places. When the weather’s frosty, clouds are grey, and life’s got you feeling all the emotions you don’t want to feel. Grab a bowl. And a friend. (Some brain-numbing TV won’t hurt either…). nibs etc. original recipe. Serves 4-5. Place your raisins in a bowl with the pineapple juice and set aside. Wash – don’t peel – and chop your carrots roughly into 1inch cubes. Set aside. Peel and finely chop your ginger, turmeric, garlic, and using a pestle and mortar grind into a paste (adding a drop of water to facilitate). Add your spices, and grind until fully incorporated and as smooth as you can get it. Heat a couple of tablespoons of olive oil in your large sauce pan for about 30 seconds before adding your spice paste. Cook through on medium high until softened and starting to golden, before adding your tomato paste and letting cook for a further minute or two. Add your carrots, another large pinch of salt, stirring with a spoon to coat in the oil and spices, before covering and lowering heat to low. Leave to cook in their own juices for about 30-40 minutes, until carrots are well softened - stirring occasionally to ensure nothing is catching on the bottom. Temporarily take the cooked carrots off the heat, add 1-2 cups of hot water as well as a touch more olive oil to help emulsify, and using a hand blender, puree until smooth. Add as much water as needed until desired consistency is reached. Place back on the heat and season to taste – I added a pinch more salt, ground turmeric, cumin and cinnamon. Heat on low-medium heat with a lid half on, until hot and gently simmering. Meanwhile, pour the raisins and juice into a frying pan, and heat on medium-high heat for a few minutes, until the juice has reduced and is starting to caramelize. At this point, add the hazelnut and za’atar mix, and stir together over a medium flame to heat through and coat evenly, until you are left with a sticky nutty mix – but no solid caramel! 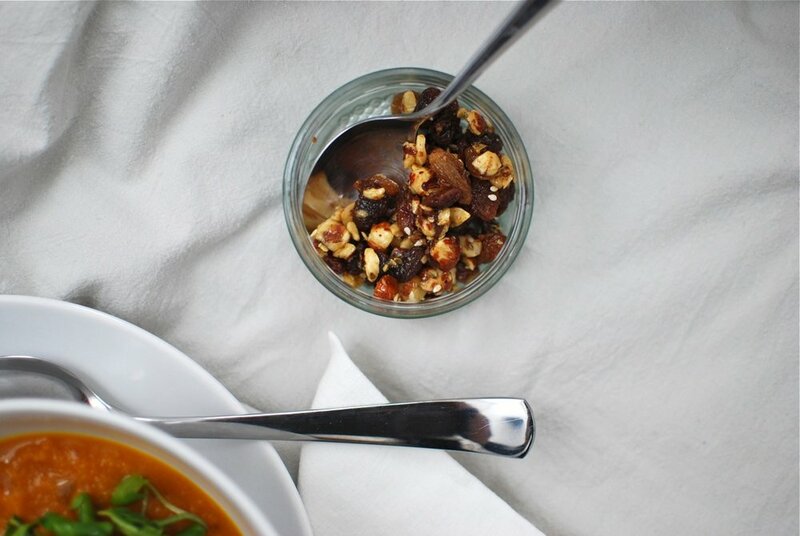 When ready to serve, dish up your soup, top with a dollop of plain yoghurt - The Collective being my personal fave here in the UK - , crumble over about a teaspoon of your sticky spiced nut and raisin mix, a small handful of lamb’s lettuce, drizzle of olive oil and pinch of flaky salt. Accompany with a slice of pumpernickel/whole wheat bread or paratha slathered in butter. Substituting any other root vegetable you have on hand, for the carrot: parsnip or celery root, for example. If you don't have plain yoghurt on hand, instead try crème fraîche, sour cream, cream cheese or labneh. Other substitutions: arugula for lamb's lettuce, almonds for hazelnuts, orange juice for pineapple.